A pizza parlor is being criticized for asking customers to order a pie in another language. Dallas-based Pizza Patrón, with 104 outlets across the country, plans to give away 80,000 large pepperoni pizzas on June 5 to anyone who orders in Spanish, according to a report in USA Today. Some have slammed the deal, as immigration remains a hot button issue in the country. "It seems to punish people who can't speak Spanish, and I resent that," Peter Thomas, chairman of the Conservative Caucus, says in the report. "In public areas, people should be speaking English, and that includes pizza parlors." "Maybe they thought it was a cute thing to do, but I think it's discrimination," says Marcela Gomez, president of Hispanic Marketing Group in Nashville. Pizza Patrón brand director Andrew Gamm says 70 percent of the company's customer base is Spanish-speaking, and they are simply trying to reach out to their target market. They called the promotion a way to honor the "positive force of change immigrants have made in communities throughout America," in a press release. Pizzas are available from 5pm to 8pm and the limit is one per customer. 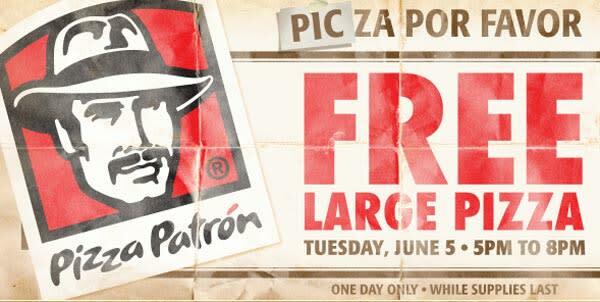 Pizza Patrón has also run similar promotions in the past that were met with controversy. In 2007, it began accepting Mexican pesos for payment. "We got death threats," says Edgar Padilla with Pizza Patron in a CBS Dallas report. The station says some of the outlets plan to beef up security during the promotion -- mostly in anticipation of long lines.